PAYSON – When anglers head to two eastern Arizona rivers this spring for trout season, that lunker fit for the frying pan may look surprisingly high-tech, starting with a 6-inch wire hanging from its belly. As part of a program to study how far stocked fish range and collect other data, the Arizona Game and Fish Department will equip 35 rainbow trout with dime-sized radio transmitters and identification tags. Entering its second season, the Robot Fish Program has already helped the agency improve its strategies for releasing trout, said Bill Stewart, aquatic research program manager for Game and Fish. In the previous release, Stewart and others tracked 35 so-called robot fish released in the East Verde River. The 2015 releases, scheduled for April, will be in the east fork of the Black River and the Little Colorado River in the White Mountains. “It’s a way to kind of estimate the ultimate goal, which is trying to optimize the number of fish to stock while maintaining high catch rates,” he said. Stewart said one takeaway from last year’s release is that trout aren’t being harvested as quickly as he and others thought. A robot fish is a full-grown rainbow trout, about 12 inches in length, that has radio transmitter surgically implanted in its belly and a tiny orange identification tag inserted near its dorsal fin. Each transmitter costs between $125 to $150. Stewart said it would be far less expensive to use just identification tags and to rely on anglers to report when and where they reel in one of the fish, but he said using transmitters is faster and more accurate. The Robot Fish Program is funded through the U.S. Fish and Wildlife Service’s Sport Fish Restoration Program, which disperses money from an excise tax on fishing equipment, motorboats and small-engine fuels. Sally Petre, a Game and Fish sport fishery biologist who performed all 35 of the implant surgeries last spring, said she had no prior experience with trout surgery but did practice on bananas. “We try and keep the surgery to really a minimum amount of time. We try and keep it to about one minute,” she said. After the fish are released, researchers carrying handheld antennas track them daily by following transmitter frequencies that are unique to each fish. They followed last year’s robot fish anywhere from the riverbank to a bird’s nest to anglers’ coolers, Stewart said. “How many of those fish that we are stocking are getting caught by anglers? How many of them are leaving the area the area we are stocking? And how many are just dying of natural causes?” Stewart said. 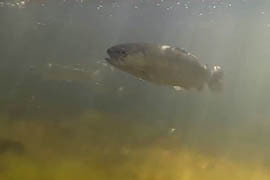 Anglers who catch these trout are free to eat them, though Game and Fish asks that they remove the transmitters, call a number on the ID tag and return the devices to the agency. Before the Robot Fish Program, Game and Fish officials would interview anglers in the field about their catches, how long they fished, how many fish they caught and how many fish they kept. 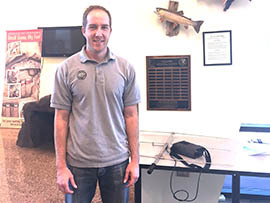 Trevor Nelson, fish culturist at the Tonto Creek Fish Hatchery, said that approach meant finding out how many fish were in an area was just a guessing game. “If we put a fish in this hole, does it stay in this hole until it gets caught? Or does it go up and down the creek for a mile?” he said. Amy Burnett, information and education program manager for Game and Fish, said the data has shown that some fish are migrating while a majority are staying put. She called the program exciting, and not just for the researchers. This video from the Arizona Game and Fish Department shows fish outfitted with radio transmitters. Bill Stewart, aquatic research program manager for the Arizona Game and Fish Department, says the Robot Fish Program has helped the agency improve its strategies for releasing trout.